Kadena AB's history dates back to just before the U.S. invasion of Okinawa on April 1, 1945, when a local construction firm completed a small airfield named Yara Hikojo near the island's village of Kadena. The airfield, used by Japanese warplanes, was one of the first targets of the U.S. 10th Army and was captured just hours after American troops stormed the island. What the Americans captured was nothing more than a 4,600-foot strip of badly-damaged coral runway. Army engineers quickly made repairs and by nightfall the same day, the runway could accept emergency landings. Eight days later, and after some six inches of coral were added, the airfield was declared operational and put into immediate service. By August 1945, an additional runway was built and the original runway lengthened and improved to accommodate bombers. Kadena Air Base was born. Operating from the largest U.S. installation in the Asia-Pacific region, the wing defends the U.S. and Japanese mutual interests by providing a forward power projection platform with integrated, deployable, combat power. The Wing operates a fleet of 81 combat-ready aircraft to perform air superiority, aerial refueling, airborne warning and control, and combat search and rescue functions. In addition, a force of 8,000 trained Airmen is postured to support Air Force commitments in the Pacific region as well as U.S. military commitments around the world. Okinawa is located southwest of mainland Japan, surrounded by the Pacific Ocean and the East China Sea. The nearest commercial airport is Naha International Airport located in the city of Naha, located off of Highway 58. The military contracted flight "The Patriot Express" lands at Kadena AB's AMC flight terminal. If you are traveling with pets, your pets can be directly picked up at the baggage claim section once you deboard the plane. Your sponsor should meet you at the AMC Terminal to transport you to the Shogun Inn registration desk. If your sponsor does not meet you at the AMC terminal, you may call the Shogun Inn registration desk for shuttle service. The Shogun Inn operates shuttle service daily from 5:20 a.m. to 11:30 p.m. If you arrive after hours, you may call 99-939-1660 for a taxi on base. On base taxis accept only yen. Naha International is the commercial airport where you will arrive if you are not flying on the military contracted flight. Naha International is located approximately 45 minutes to 1 and 1/2 hours from Kadena AB depending upon traffic. It is very important to make sure you have contact with your sponsor prior to arriving in Okinawa so someone will be available to meet you at the airport and assist you with processing into the base. If your sponsor has not arranged transportation for you, there are transportation options available. An Air Force shuttle bus provides service to Kadena AB. The service runs 7 days a week excluding federal holidays, family days and Typhoon Condition 1. For more information, please contact Vehicle Dispatch at DSN: 315-634-4505. 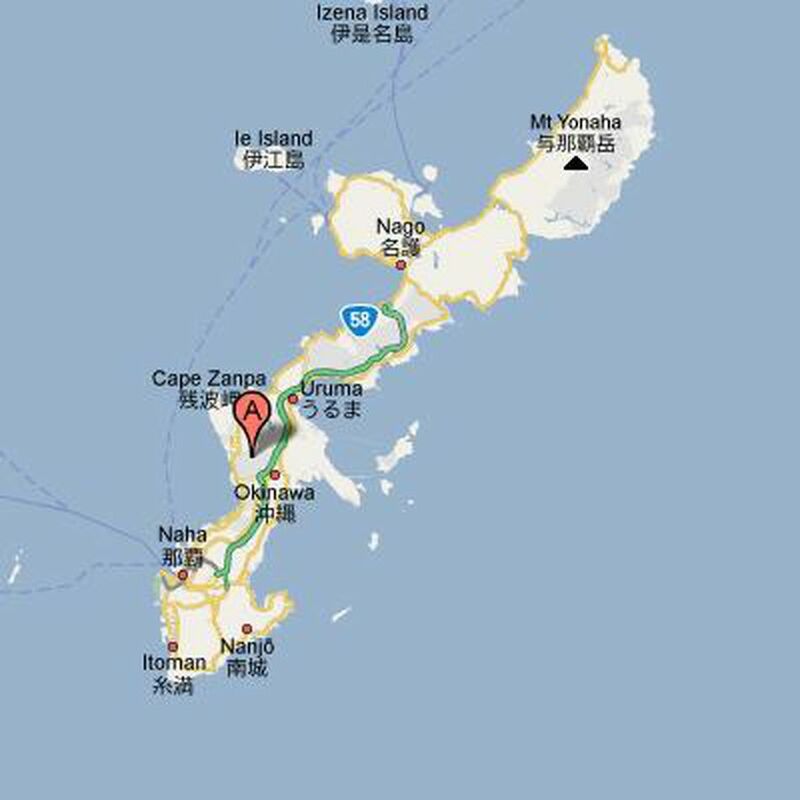 Commercial taxi service is also available to Kadena AB for approximately 5,000 yen ($50 equivalent). Please be certain the taxi is labeled "on-base" access or you will not be able to enter the installation. The taxi drivers accept yen only. If you were routed through mainland Japan, you will arrive at the domestic terminal. If you have yen, you can use a pay phone and call 938-1111, then after the dial tone, dial the base phone number. Once in Naha, the Naha International terminal has a DSN line available at the Information Booth. The Shoguns of the 18th Wing are organized into five groups: operations, maintenance, mission support, civil engineer and medical. Team Kadena includes associate units from five other Air Force major commands, the Navy, and numerous other Department of Defense agencies and direct reporting units. In addition to the 81 aircraft of the 18th Wing, associate units operate more than 20 permanently assigned, forward-based or deployed aircraft from the base on a daily basis. Nearly 18,000 Americans and more than 4,000 Japanese employees and contractors make up Team Kadena. The main lodging office is located at the Shogun Inn, Bldg. 332. To make reservations, please call 1-888-AF-LODGE. Cost for on-base quarters is based on where you are assigned and not what your rank is. VQs/VOQ/VAQ rates are approximately $39.00 per night. If on-base quarters are not available, then contract quarters for TDY guests will be utilized. Non-availability statements/numbers are issued when on-base quarters and contract quarters are not available. Distinguished Visitor (DV) Suites are available for O-6's and above (civilian equivalent). Individuals requesting DV suites should contact Wing Protocol at DSN 315-634-0106/1808. There are 122 family units on Kadena AB with a cost of $42 per night per family. Due to the high volume of guests, families PCSing are authorized for a maximum of 30 days in the TLFs. It is important that you or your sponsor make reservations for TLF as soon as you receive your port call. Rates for off-base hotels average approximately $125 per night and vary according to the hotel, season, and size of the family. A list of off-base hotels is available to you or your sponsor at the Shogun Inn front desk. Pets are authorized to stay at the Shogun Inn if pet rooms are available. Contact your sponsor for assistance if traveling with pets. If you will be living in a dorm, have your sponsor arrange for your room prior to your arrival. If dorm rooms are available, billeting is not authorized. Dormitories vary with your squadron of assignment. Check with your sponsor for current dormitory requirements. All Housing on the island is managed by the Housing Office on Kadena AB. Effective 1 August 2009, all inbound accompanied military personnel will be required to reside on base. Military assignments will take priority over civilian assignments. Civilians will be assigned on an excess inventory basis only. Newly assigned military members will be introduced to the new housing program through their mandatory Family Housing Overview brief. Eligible personnel must submit an advance application (DD Fm 1746, Application for Assignment to Housing) to the gaining installation for family housing at any time after they have received PCS or active duty orders. Applicants should provide any information regarding an impending promotion, an expected increase in the number of dependents, or a family member's maturation which would qualify an eligible applicant for more bedrooms within the next 12 months. If an advance application is not received, the member will receive the date of walk-in as the application/eligibility date on the waitlist. This form should be mailed along with a copy of orders to the following address: 718 CES/CEH, Unit 5261, APO AP 96368-5261. Within the first three days after arriving on station, all personnel should report to the Housing Office. The first appointment is a mass in-processing briefing. All off-base housing must be approved by the Housing Office before a lease is signed. Pets are not authorized in any of the on-base high-rise or mid-rise apartments. There are 17 base dormitories providing living quarters for unaccompanied airmen, noncommissioned officers, and officers. Unaccompanied personnel E-5 and below are not authorized to live off base. Most organizational enlisted dormitories are private rooms with communal bathrooms. Many of the dorms are undergoing renovations at this time so make sure to talk to your sponsor for more information about where you will be living. Unaccompanied personnel should FAX or e-mail a copy of your orders to their sponsor, so a room may be reserved prior to your arrival. Kadena has 47 apartment-style quarters in 2 buildings which meet standards for all officers and civilian equivalents. Each apartment consists of a living room, bedroom, private bathroom, and kitchen. Apartments are fully furnished, carpeted and have central air conditioning. There are 135 rooms designated as unaccompanied NCO quarters. They have private bathrooms and central air conditioning. Kadena Housing Office does not have specially designated EFM housing. However, the Housing Office can work with families individually and on a case-by-case basis to best accommodate EFM needs. Non-command sponsored individuals are not eligible for government housing. If you do not have an area clearance, you are not eligible for government housing. All incoming personnel that have school-age children are to contact the District Registrar at DSN: 315-634-8995 prior to enrolling their children in school. Personnel should wait until after they have had their housing briefing to enroll their children in school. This is in an effort to avoid having to move children from the school they are zoned for while in billeting to the school where their permanent quarters will be located. There are no American "public" schools available in Okinawa. Children of families with orders to Okinawa attend the Department of Defense Dependent Schools (DoDDs) on the various bases at no cost. They can also choose to attend one of the various religious affiliated schools off-base which have varying fee structures. Requirements for enrollment in DoDDS are the following: (a) Orders, area clearance, social security number and or similar documents to verify the student status. (b)Certificate of Immunization issued by one of the following medical facilities on Okinawa to verify currency of immunizations: Naval Hospital located at Camp Lester, 18 Wing Medical Group Clinic located on Kadena AB, the Camp Courtney Clinic and the Camp Kinser Clinic. (c) Individualized Education Program (IEP) and any other supporting documentation if the student has been declared eligible for special education service; and student records for previous school(s) to assist in proper placement. (d) Passport or birth certificate of the student entering school for the first time to verify age. Remember to hand carry all important documents. Please note the sponsor is required to sign enrollment documentation; however enrollment is not denied due to unavailability of a sponsor. If you have children with disabilities from ages 3 to 21 (unless graduated from high school), you are required to enroll in the Exceptional Family Member Program (EFMP) at your current command. EFMP screenings are required prior to PCS move overseas. There are many opportunities for those wishing to home educate their children while living on Okinawa. There are three support groups (OCHEA, IDEA International, and FISH (Faith in Schooling Homes), as well as, support groups, CO-OP groups, and play-groups open to all military island-wide. For Japanese schools, parents must contact the Board of Education upon their arrival to Okinawa. All Kadena Child Development Centers have been accredited by the National Association for the Education of Young Children. Staffing in our overseas location is our greatest challenge. If you live on Okinawa or are PCSing to Okinawa, consider a career in Child Development. Training is provided on the job and the rewards are great. A copy of the sponsor's orders and completion of a DD Form 2606 for each child is required to place children in the CDC. Kadena currently has 3 centers on base: Shima No Ko located in Building 4081, Niko Niko located in Building 334 and Wakaba located in Building 132. The centers serve children between the ages of 6 weeks and 5 years of age and currently have more than 600 children enrolled in the programs. Before and after kindergarten programs are available and a part-day preschool program is offered for children 3-5 years of age. All 3 facilities provide full-day care. In addition, an hourly care program is offered at each facility for children 6 months to 5 years of age. Weekly fees are based on total family income in accordance with DoD guidelines. Fees for hourly care are $3.50 per hour and reservations may be made for up to 10 hours of care per week. There is a waiting list for full-time care. Priority is given to single and dual military families; however, families should be prepared to contact family child care homes for care upon arrival. Waiting times for center-based care may vary depending upon the age of the child. For information about the waiting list for full day care, please contact the Child Development Center at DSN 315-632-7693. Family Child Care (FCC) is offered to children in licensed providers' quarters. The FCC program offers a wide variety of quality services including early infant care, before and after school care, extended duty care (for temporary shift changes, early morning PT), full time and drop-in care. Some FCC providers participate in the free PCSing Child Care Program paid for by the Air Force Aid Society. All ranks are eligible for 20 hours of care per child within the first 60 days after arrival on Okinawa and the last 60 days before departure on a space-available basis. If a shortage of care spaces exists, priority will go to E5s and below. The Youth Programs operates a School Age Program to provide supervised care for young, school-aged children before and after school. The 18th Medical Group is the USAF's largest free-standing outpatient clinic and provides quality ambulatory and dental care to a beneficiary population of 21,000. There are approximately 450 personnel authorized on the staff and the group is located in twelve buildings on Kadena. Our Neonatology Intensive Care Unit (NICU) is located at the U.S. Hospital Okinawa at Camp Lester which is approximately three kilometers from Kadena AB. Appointments in the following clinics are made by calling their offices directly: Optometry 630-4038, Immunization 630-4415, OBGYN 643-7520, Pediatrics 630-4542, Family Practice 630-4272, Dental 630-4011, Aerospace Medicine 630-4195, Mental Health 634-1266, Physical Exams 630-4224, and the Wellness Center 634-2499. Acute Care Services offers same day services for acute problems between the hours of 0700 - 1800 Monday through Friday and 0800 - 1400 on weekends and holidays. A 24-hour ambulance crew is available to transport patients to the U.S. Naval Hospital Okinawa Emergency Room. Telephone Consultations with 18th Medical Group providers are available 24 hours per day, seven days per week. During normal duty hours (M-F, 0700 - 1600) consultations are available by contacting individual clinics directly. Telephone consults are an excellent way to take care of minor medical problems with minimal inconvenience to patients and has been an overwhelming success. Calls received before 1100 will normally be returned by noon. Calls received before 1500 will normally be returned by 1600 or the next duty day. After duty hours, contact Acute Care Services at 630-4684, providers will normally return your call within the hour. Each patient must have a DD Form 1173, Uniformed Services Identification and Privilege Card, or DD Form 2, Armed Forces Identification Card in their possession for each visit to the clinic. Family members 10 years old and over are required to have their own DD Form 1173. Family members under the age of 18 must be accompanied by a parent or legally appointed adult on each visit to the clinic unless a properly completed parental consent form is on file in the family member's outpatient medical record. Certain non-military DOD sponsored beneficiaries are entitled to receive healthcare services from uniformed services medical treatment facilities on a fee for service basis. On the day of your appointment, please come in 10 minutes before your appointment to pick up health records at Medical Resource Management Cashier's Office Room 122. It is not necessary to report to Medical Resource Management to get a "voucher" prior to a dental appointment. Payment vouchers will be processed by the clinic cashier. Please contact the Cashier's Office for more information at 634-4346, Mon - Fri 0700 - 1600.